Inoculation is the injection of dead or weakened disease-causing bacteria or viruses into the human body in order to produce immunity against (prevent infection by) that disease. Because the organisms injected into the body are dead or weakened, they can create immunity without causing the disease. The material injected into the body is called a vaccine. The term vaccination originally referred to immunization against smallpox because the procedure originated when English physician Edward Jenner (1749-1823) discovered that milkmaids who had contracted the mild disease cowpox (vaccinia) were immune to smallpox. The development of a cowpox vaccine against smallpox has led to the production of vaccines against a wide range of diseases. Long before the colonial period in Africa, some tribes practiced a method of protection against smallpox called variolation. It involved inserting fluid from smallpox blisters under the skin. This was intended to produce a mild form of the disease and give the person immunity from severe illness. In some parts of Asia, a mixture of smallpox scabs and pus was pricked into the skin. The Chinese blew powdered scabs into the nostrils. The technique of scratching smallpox fluid onto healthy people was introduced to Britain and western Europe in the early 1700s. Variolation became quite popular for a short time but soon lost favor as its potential dangers became more apparent. The procedure also became popular in the American colonies for awhile, but was eventually outlawed by several states until shortly before the American Revolution (1775-1783). Variolation remained controversial until Jenner's famous 1798 announcement. In eighteenth-century Europe, a smallpox epidemic raged. In the cramped medieval towns, the disease was fueled by garbage and even human excrement (waste) clogging the narrow streets and inadequate sewers. One in ten persons died of the disease, most of them children. It is said that one in three persons in London bore pit marks from smallpox. Common folk wisdom spread the idea that anyone who contracted cowpox, a similar, milder disease of cows, became immune to human smallpox. In 1796 Jenner decided to test an idea. He took some cowpox fluid from the sores of a milkmaid named Sarah Nelmes and rubbed it into cuts on the arm of an eight-year-old boy named James Phipps. A few days later James came down with a mild case of vaccinia (a form of cowpox contracted by humans), but soon got over it. Six weeks later, Jenner gave James some fluid from a person who had smallpox. The boy was not affected and had gained immunity from the inoculation. To describe the inoculation, Jenner coined the term vaccine, from the Latin word vaccinus, or "of cows." Because of the success of his vaccine, Jenner was given a grant of money to continue his work. Soon thousands of English citizens were vaccinated, including the royal family. The practice spread to Germany and Russia. The president of the United States at the time, Thomas Jefferson, wrote to Jenner congratulating him on his success. When Jenner's vaccination was made available in America, Jefferson made sure that members of his family were vaccinated against smallpox. Jefferson praised Jenner for having found a way to rid humanity of smallpox. For half a century smallpox remained the only disease for which there was a vaccine. Attitudes about disease prevention slowly began to change during the 1800s. People began to realize that filthy living conditions, dirty drinking water, and the lack of proper sewer systems could be associated with out-breaks of disease. Pioneers in health care, including nurse Florence Nightingale and surgeon Joseph Lister, (1827-1912) brought on the sanitary movement by calling for clean instruments and bedding in hospitals. Increasing numbers of surgeons began using antiseptic methods, even though many still did not believe that microorganisms, or germs, caused disease. A girl gets an inoculation. 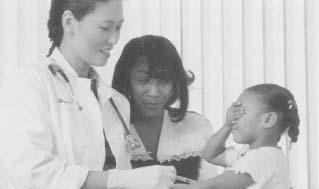 Inoculation is the injection of dead or weakened disease-causing bacteria or viruses into the human body in order to produce immunity. In the mid-nineteenth century, French chemist and microbiologist Louis Pasteur (1822-1895) was developing his germ theory. The theory held that specific microorganisms cause specific diseases. Pasteur's first experience with microorganisms as the cause of disease occurred when he was investigating a disease of silkworms in 1865. The disease had almost destroyed the French silk industry. Pasteur was able to prove that the disease was caused by a microorganism. This microorganism infects the moth that lays the eggs from which the silkworms hatch. Weeding out the affected eggs and removing the source of infection saved the silkworm industry. Even more important, however, was the implication of Pasteur's research. It suggested that relating specific microorganisms to specific diseases might have relevance to the causes of human illness. In 1876 Heinrich Robert Koch (1843-1910) reported on his work on the fatal illness in sheep called anthrax ("splenic fever"). He gave details of how the anthrax bacillus (a bacterium) could be grown and isolated. He also noted that the bacillus could still produce the disease in animals even after living for several generations in a laboratory. Koch's report aroused Pasteur's interest in the relationship of microorganisms to disease. Pasteur soon had developed a method to protect animals against anthrax by injecting the animals with anthrax bacilli that had been severely weakened by a special treatment; this prevented the bacilli from causing the disease. These findings were reported in 1881 and established the principle that the disease-producing properties of a microorganism can be so weakened that it will produce immunity to the disease without actually producing the disease. Over the next few years Pasteur applied this new principle to develop a method for preventing rabies in persons bitten by rabid animals. In 1885 a young boy named Joseph Meister who had been bitten by a rabid dog was brought to Pasteur. Because other doctors agreed with Pasteur that the out-look for the boy was hopeless, Pasteur decided to try to inoculate him against the rabies. When the boy failed to develop signs of rabies, Pasteur knew that his theories and experiments had been correct. The success of Pasteur's antirabies vaccine gained him much attention and marked the first time that his methods had been applied directly to humans. After that breakthrough, bacteriology and immunology proceeded at rapid pace. Pasteur's assistant, Pierre-Paul-Émile Roux (1853-1933), continued their work in bacteriology, concentrating on the disease diphtheria. He found that not only did a specific bacteria cause diphtheria, but a toxin (poison) produced by the bacteria caused disease symptoms. Together with Alexandre-Emile Yersin (1863-1943), he isolated the diphtheria bacillus and developed an antitoxin to counteract the diphtheria. Soon scientists discovered more and more bacteria, developed numerous vaccines, and learned new techniques to prevent other diseases. SmallPox is(was) caused by the virus Variola. The disease has now been eradicated. The technique of inoculation was not invented by Jenner and Pasteur but was devised in the Muslim world and brought to Europe from Turkey by the wife of the English ambassador to Istanbul in 1724. Children in Turkey were vaccinated with cowpox to fight the deadly smallpox at least 50 years before the West discovered it. The first clear reference to smallpox inoculation was made by the Chinese author Wan Quan (1499–1582) in his Douzhen xinfa (痘疹心法) published in 1549. It was then widespread in China during the Mind Dynasty.